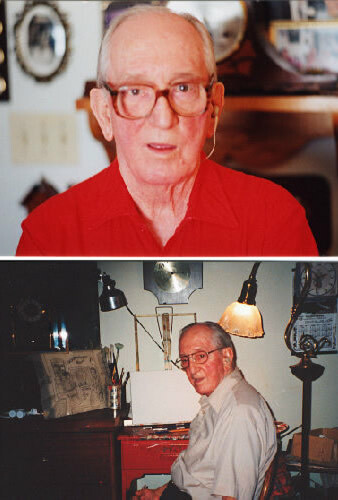 William Male, also known as Bill or Willie, was born in 1918. He was an anglophone Quebecer who lived most of his life in or near Montreal, except for the war years which he spent in Europe, serving in the Canadian Armed Forces. After being wounded in Italy in 1944, Bill returned deaf in one ear, to Montreal, where he found employment as a furniture restorer with the firms of Henri Morgan and Alexandre Craig. 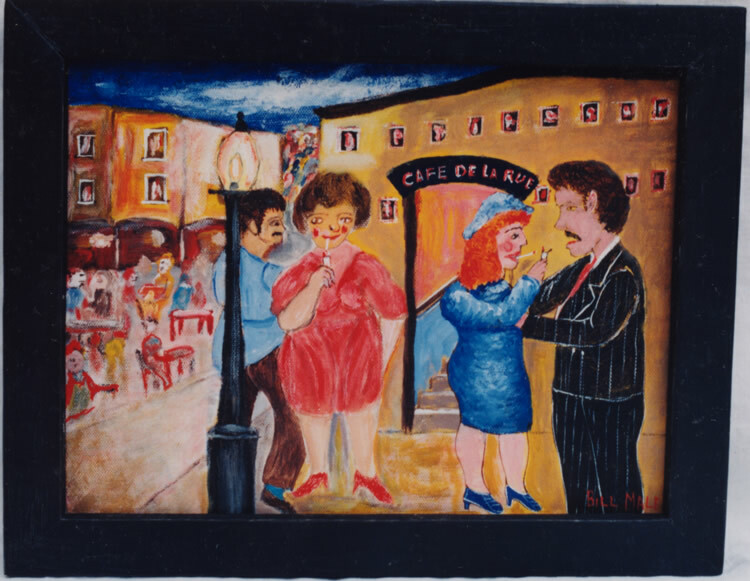 In the 1970s, without any training of any kind, Bill Male started painting. Perhaps it was in response to certain voids in his life as a bachelor: “I never got married, the war got in the way of that” he said. 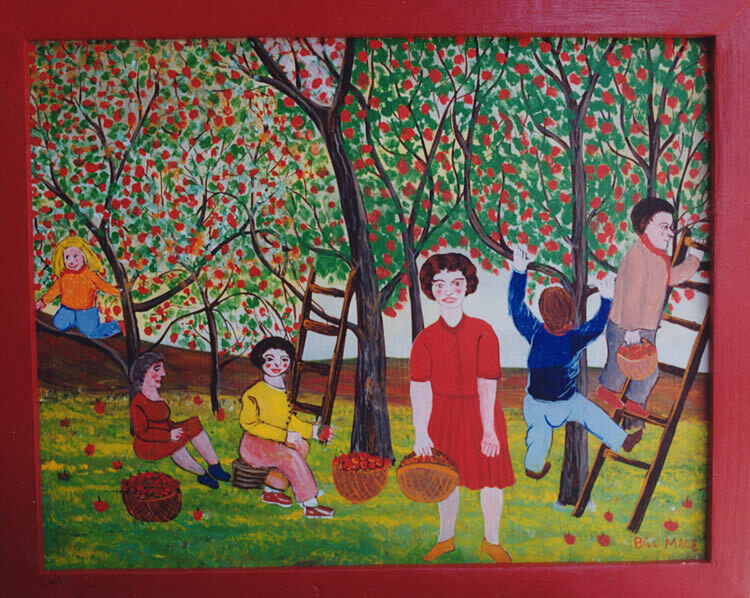 Perhaps his solitary life prompted him to fill his paintings with images of people enjoying various social activities – viewing a show, sitting in a bar, picking fruit in an orchard, playing cards… In any case, these images speak of joy, friends, love and family. 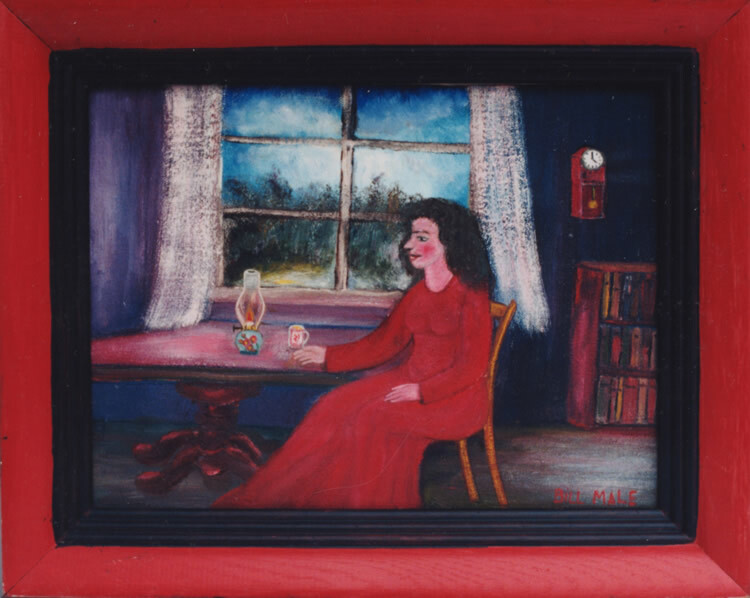 There are also, however, expressions of melancholy and loneliness in Bill Male’s work, especially the solitary portraits which often feature a woman sitting alone and waiting. When Bill Male retired he opened his own little antiques restoration shop in the town of Hemmingford, Quebec. He worked in his shop every summer and spent his winters painting his dreams and reminiscences. 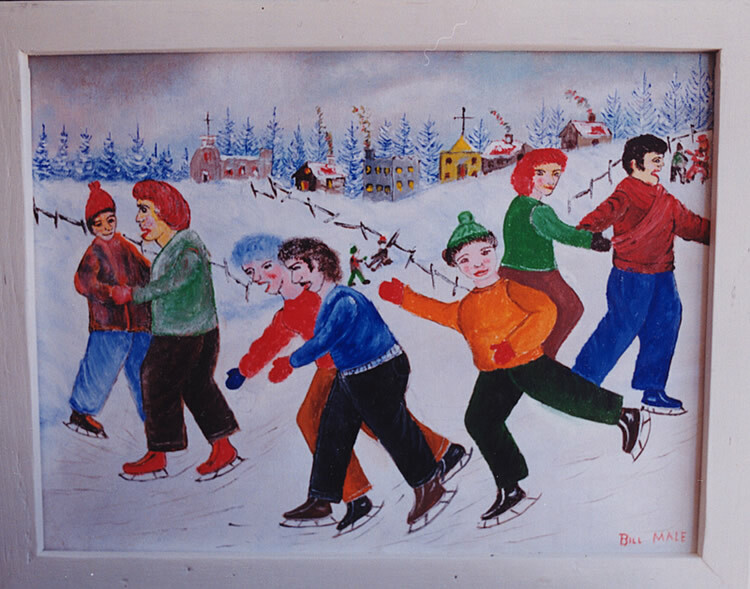 We used to see Bill’s work from time to time at the picker’s barns, and then in the mid-nineties a collector friend noticed one of his paintings in our truck and said “That’s one of Bill’s paintings. I know where he lives. Would you like to meet him?”. Sure thing. So with directions in hand, and a phone call ahead we arrived mid-morning at a three story, 1940’s apartment block near the baseball diamond at the edge of town. Bill buzzed us in and we climbed to the second floor and arrived at his door. He must have been standing right on the other side because the second we knocked the door flew open and there stood Bill, all smiles, peering through those thick glasses. His small one bedroom apartment was that of your old bachelor uncle’s pad. 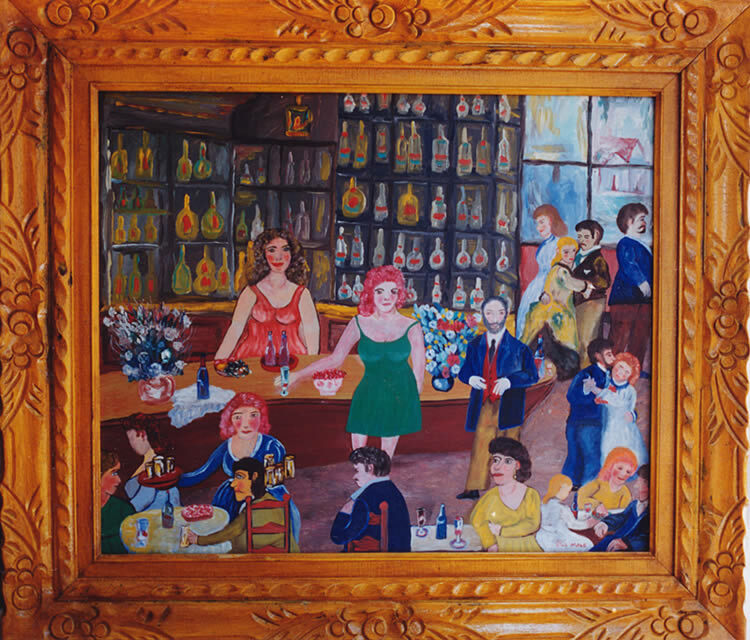 Tidy, but full of upholstered chairs, crochet covered tables, and knick-knacks; with every square inch of wall space covered by his paintings in every type, colour, and size All in reclaimed frames of every type and colour. The effect was a bit dizzying, but also warm and hospitable. “Everything is for sale, and at reasonable prices”, and so we picked out our favourite twenty or so and paid him what he asked in cash. Bill didn’t talk much, and he never offered to make us tea or anything, but over a few visits he did start to warm up and tell us some stories from when he was in Europe, and one funny story of how he almost got killed in his workshop. Well, funny because no one got hurt. Bill rented a garage for his work from a very old neighbor lady. He was slowing down on accepting work but still doing the occasional project for a neighbor. So he was working away one winter day with the doors closed and the heat fired up. He was standing at the side of the shop putting wood in the woodstove when suddenly there was a tremendous crash, and bang, and shattering of wood in every direction as an old sedan came smashing through the closed doors, raced the length of the building knocking everything asunder, and went smashing out the far wall into the back yard. Turns out his old landlady had arrived at a day when she confused the gas and brake pedals, and she tried to slam on the brakes. “It happened so fast I didn’t know what the hell was going on, but I knew I was damn lucky to be standing aside”. “You’ve got that right, Bill. We would go to see Bill another five or six times, always happy to see his new work, and to have a chance to get to know him a bit better. We even wrote back and forth a bit. He would send me pictures of his new paintings and ask which ones he might put aside for me. He was a lovely guy. Then on one late fall day in 2003, we found ourselves in the area and decided to drop by. He didn’t answer his phone but we knew he didn’t leave the apartment much so we took a chance and just arrived and rang his buzzer. Someone answered but it wasn’t Bill. The fellow explained that Bill had died suddenly a few months before, and he was the new tenant. He didn’t have any information on Bill as he did not know him. With no living relatives and not knowing his friends we were struck with a sadness, made sadder somehow because there was no one to express our condolences to. We said a silent goodbye and left.